This coat is very warm. Fits true to size and like how it is longer in the back. The fur around the collar is removable which was nice to be able to take it off. 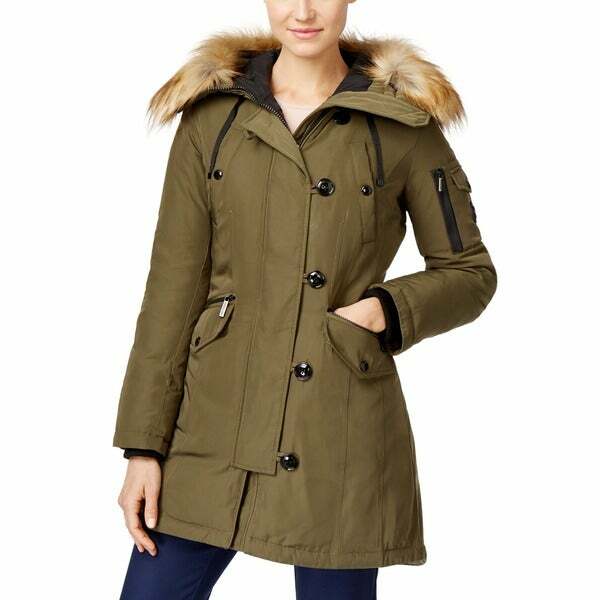 Stay warm and cozy while maximizing your style with this olive green parka from Micheal Kors. Featuring a removable faux-fur trim on the drawstring hood, this fashionable parka matches well with numerous outfits. It is extremely comfortable and very soft. It's a heavier coat so it'll definitely keep me warm this winter. I love Michael Korrs!!!! MY GRAND DAUGHTER SCREAMED WHEN SHE GOT THIS COAT. SHE EVEN POSED FOR PICTURES. THX!!!! What a gorgeous coat. This is a super heavy coat for anyone looking for that level of warmth. It does run large however so I recommend not sizing up for layers. Beautiful jacket and lots of pockets. Love it. Love it. Nice & warm, perfect fit. A PERFECT FIT . A VERY STYLISH COAT. VERY WARM . Love the color and all the pockets. Also I need a jacket warm enough to go to see my daughter in Washington state where it’s cold.